Sheetmetal fabricator Du Fresne Manufacturing Co., Vadnais Heights, MN, opened its doors in 1991 “with the vision to excel in an environment that fosters member (employee) development, innovation and state-of-the-industry technology to deliver exceptional customer service,” says Michael Rosenthal, vice president of operations. With facilities located in Vadnais Heights and in White Bear Lake, MN, Du Fresne employs 90 members with 70,000 sq. ft. of manufacturing and assembly space between the two locations. The HG ATC (automatic tool changer) press brake is touted as “an ideal solution for variable lot sizes and complex tool layouts…the tool changer can load the most complex tool layout within 3 min., and allows operators of varied experience levels to efficiently use the system…quick tool setups give users the ability to introduce rush jobs seamlessly,” states Michael Rosenthal, vice president of operations at Du Fresne Manufacturing Co. 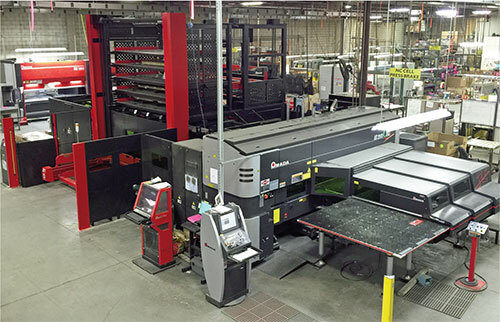 The firm’s most recent strategy to be the supplier of choice includes using new technology to make the competition irrelevant with the addition, in 2015 and 2016, of a new punch/fiber-laser combination machine (an Amada LC 2515 C1 AJ), and two Amada HG 1003 ATC press brakes equipped with automatic tool-change (ATC) capability. The new punch-laser combination machine has dramatically changed the way parts are processed at Du Fresne. While a standard turret press that uses an average of 15 to 20 tools per job would take approximately 70 min. to set up, says Rosenthal, Du Fresne operators can set up the new combination machine, using a standard tool package, in about 25 min., a 64-percent reduction. Automatic tool-change capacity on the Model 1003 press brake is 86.6 ft., with 15 punch stockers and 18 die stockers. On-board tool storage has contributed to a 214-percent increase in the number of jobs completed at Du Fresne, including setup and run. The combo can punch when needed, apply forming tools such as countersinks, make threaded tapped holes or other special features, and use the laser to cut holes and part peripheries. Rosenthal explains that it is equipped with a picker-loader system that has eliminated the handling of scrap blanks and, more importantly, shakeout, a secondary process of removing parts from the nest and transferring them to a skid for the next operation. The picker pulls parts from the nest and places them on a skid located in the material-storage tower. Along with its new automated press brakes came this innovative punch-laser combination machine, with a sheet-storage tower and automated part sorter, which Du Fresne’s Rosenthal credits with dramatically changing the way parts are processed. While a standard turret press that uses an average of 15 to 20 tools per job would take approximately 70 min. to set up, operators can set up the new combination machine, using a standard tool package, in about 25 min., a 64-percent reduction. 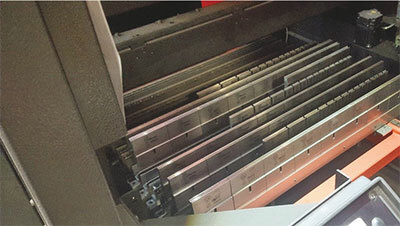 ATC capacity on the Model 1003 press brake is 86.6 ft., with 15 punch stockers and 18 die stockers. 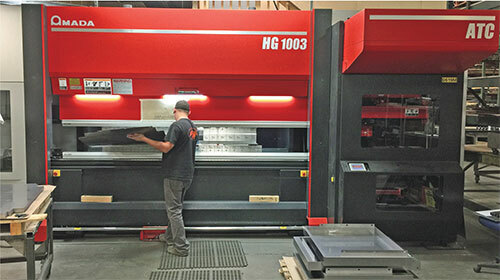 Amada also offers the ATC on its HG 2204 press brake, with 112.8 ft. of tool capacity, 18 punch stockers and 25 die stockers. The HG-series press brakes are servo-hydraulic models designed to optimize cycle times, via fast approach, bending and return speeds. Ram positioning and repeatability are ±0.00004 in., and to facilitate quick setup of multistage part-bend sequences, operators appreciate the programmable ram-tiling capability as well as the brake’s 50-percent off-center bending capacity. Other features include dynamic hydraulic crowning (two crowning cylinders in the 1003 model, three cylinders in the 2204 models), and eight-axis backgauging. Lastly, the press brake’s 18.5-in. touchscreen control provides a graphical interface that Du Fresne operators find minimizes the learning curve—they can use the control to identify and open bend programs, manage the tool library, adjust the machine axes as needed and visualize, in 3D, part positioning during the bending sequence. Prior to adding the new automated press brakes, Du Fresne operated with 12 standard press brakes, along with four turret presses and a fiber-laser cutting machine. In addition to that improvement, Du Fresne can program the press brakes offline, freeing operators to move quickly from job to job, and, therefore, complete more jobs and add capacity. After 8 months of using the initial HG, Du Fresne decided to add the second HG press brake, and since then Rosenthal says that the shop has been able to move about 45 percent of its forming work over to the two new brakes. This increased capacity resulting from the new equipment has eased any strain it may have seen related to skilled labor. The data Rosenthal cites have greatly increased the company’s business opportunities with current and new customers. These opportunities include programming of part nests (using Amada’s Dr. Abe software), and programming the punch/laser, the press brake (offline) and the part-transfer (conveyor) operations. “We opened up a new programming position for the punch/laser,” says Rosenthal, “and two positions for programming the new press brakes. The capacity increases have boosted sales, adding manufacturing hours to our schedule and allowing us to bring on more engineers.